It is almost lunchtime and Rita does not have firewood left for cooking. Equipped with an axe and a large basket, this Kichwa woman walks in the thicket of the Amazon rainforest in search of a tree to cut. After several dozen powerful blows, the tree’s trunk yields to the woman’s force. Once she has finished the chore, she carries the heavy wood along a path that winds between rivers and ravines. When she returns home, she starts the fire for cooking; but not before collecting enough water from the river to prepare the fish soup. Rita has also cleaned her house and gone to the chakra [farm] to collect manioc to make chicha, the favourite drink in her community. Aside from all her daily duties, Rita also holds a political position: she is one of the women leaders of Sarayaku, a town in the southern Ecuadorian Amazon that has been resisting oil exploitation for over 30 years. The women of the Indigenous Kichwa Peoples of Sarayaku have played a crucial role in their community’s resistance to attempts to extract the energy wealth hidden in the bowels of their ancestral territory. Always on the front lines of marches, carrying their babies on their backs or in their wombs, the warmis (“women” in Kichwa) have raised their voice to say “No!” to extraction and patriarchy. It is a double struggle for indigenous women of Sarayaku, who are determined to resist both the Ecuadorian State’s attempts to extract oil and the ancestral patriarchy they face in their community. “Women have the same heart and the same body as men; the only thing we don’t have is a beard,” says Corina Montalvo, an 83-year-old resident of Sarayaku. “They used to call us warmi sami, that is: women who cannot do anything. But that was long ago, in a time of ignorance,” she reflects. “They would say that women are meant to cook, clean, make chicha and collect firewood, that that was women’s work. But we later realized that was not so, and we said that the men also had to work. Our children come from both of us, so men also have to raise them,” she concludes. This fierce veteran fighter from Sarayaku was one of the driving forces behind the community’s first major mobilization. It was 1992, and several Amazonian peoples of Ecuador marched to demand the government of then president Rodrigo Borja legally validate the titles of their territories they inhabited. It was the women who convinced the men to walk the almost 250 kilometres of distance and 2,000 meters of ascent. “It took us a long time to get to Quito [the capital], and it was hard to walk. There were 5,000 of us: many women, some old women, others carrying their children and still others pregnant,” recounts Montalvo, one of the 1,600 inhabitants of Sarayaku. One of the women who walked while holding her child was Narcisa Gualinga, now 72 years old. “The men wanted to go by bus, but we had no money; they didn’t want to walk. We, women, convinced them to walk,” recalls this woman, one of the founders of the pioneering Association of Indigenous Women of Sarayaku (AMIS, by its Spanish acronym). It was Narcisa’s older sister, the historic leader Beatriz Gualinga, who raised her voice against president Borja. “Though many people had studied and spoke Spanish very well, she didn’t know, but she spoke with the government,” declares Narcisa. “Beatriz spoke very powerfully. She said to the president, in Kichwa, ‘You all only do things in order to win votes.’ She shouted at him loudly,” says Montalvo. Women’s leadership in Sarayaku has continued over time. The land titles obtained in 1992 were of little use when, a decade later, Argentine oil company CGC entered communal territory to initiate seismic exploration in search of crude oil—without inhabitants’ permission. When they detected CGC’s presence, the women and men of Sarayaku got moving. “When the oil company arrived in 2002, we went to fight. The women met to decide who would go and who would stay. We had to leave our children at home. We had to neglect our chakras, and we lost the whole harvest in the struggle,” tells Ena Santi, current Women’s Leader in the Council of the Autonomous Government of Sarayaku. “I was nine months pregnant with my daughter Misha at that time, but I walked anyway,” she says. “Between 20 women, we got a canoe and went to the place where a helicopter had landed with company workers. We grabbed the workers and brought them to the center of the community. We also caught some soldiers and took their weapons away. We only had spears,” explains Santi, who was previously the secretary of AMIS, the organization that was later renamed Kuri Ñampi (Golden Path). The community ultimately managed to expel the oil company from its territory, but it did not stop there. 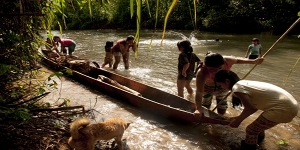 Sarayaku went before the Inter-American Court of Human Rights to denounce the State for having allowed CGC to enter without consulting the community. In 2012, the Court forced the State to publicly apologize, and to conduct free, prior, informed consultations with community inhabitants before initiating any oil project in their territory. Even though Sarayaku won the battle, its women have continued their struggle, both inside and outside the community. On March 8, 2016, coinciding with International Women’s Day, hundreds of warmis from seven indigenous nationalities took to the streets to protest the concession of two oil blocks which partially affect Sarayaku’s territory to the Chinese consortium Andes Petroleum. Kichwa, Waorani, Zápara, Shiwiar, Andoa, Achuar and Shuar women made clear their intentions to combat the extractive aspirations of Executive Rafael Correa and the Chinese oil companies Sinopec and CNPC. Although in his first months in the Government he aligned himself with the indigenous movement and environmental organizations, Correa did not take long to distance himself from them, and to continue with the extractive legacy of his predecessors. Additionally, since 2015, repression of indigenous protest has intensified. In August, a national strike promoted by the Confederation of Indigenous Nationalities of Ecuador (CONAIE) resulted in over one hundred arrests. In the Condor mountain range, the army evicted the Shuar communities of Tundayme and Nankints, in order to make way for two mining megaprojects. The case of Sarayaku is not the only one in Ecuador where women have played a leading role in the defense of their bodies and ancestral territories. From her position as women’s head of CONAIE, Katy Machoa reveals the main reason why Amazonian women are so determined to fight. “We have a very daily relationship of belonging to the earth. In the rainforest, everything comes from the earth. It is our source of life. We have no other source of income. The fact that all development and family maintenance depends on our territory means that when this has been threatened, we have organized to demand respect for our way of life,” she shares. In Sarayaku, there is still inequality in access to political positions. Despite the fact that Sarayaku’s struggle has lasted for over three decades, it is only in recent years that women have had access to the community governing council. Likewise, despite their leadership in the resistance to oil exploitation, only one warmi has been president of the autonomous government. Thus, in both the political struggle and the daily one, these women still have much to fight for.